Safe Bathing Canada provides individuals with physical limitations and mobility the opportunity to enjoy a safe and comfortable bathing experience. 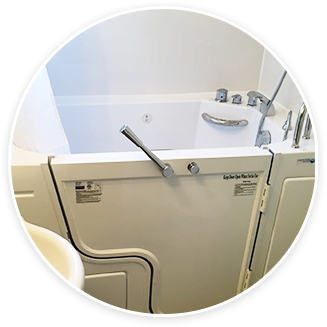 We offer walk-in safety tubs that provide safe and easy access without the risk of bathroom injuries. leaning on a glass door that was not designed to bear their weight. Bathroom injuries are more common in disabled and elderly people who lack mobility and balance, and those with impaired eyesight. Despite the potential hazards, a bathroom can still provide a calming refuge with the installation of a safety tub. Now you don't need to lift your legs over the high rim of the bath, risking slips and falls. Instead, you can simply walk into your safety tub, close the sealing door behind you and sit on the built-in seat while waiting for the tub to fill. At Safe Bathing Canada, we provide a wide range of walk-in tubs and walk-in tub / shower combinations. Walk-in tubs provide safety to allow you to enjoy hydrotherapy without having to worry about the risks of slipping and falling. The walk-in tub / shower combination product is the perfect choice for those who want to enjoy the healing benefits of a soaker tub without losing the convenience of a shower. We also offer high-end tubs with whirlpool and air jet hydrotherapy features that provide a soothing soak for individuals with arthritis and other chronic pain conditions.